A campaign to promote the new digital terrestrial television service launching next year in Germany has started, with details of how and where the new terrestrial HD TV service will be available. The newly published information confirms that the service, which will replace the original digital terrestrial TV platform by 2019, will consist of six digital multiplexes with up to seven 1080p HD TV channels per multiplex. Three multiplexes will broadcast free-to-air and will be operated by the German public service broadcasters. The other three multiplexes will contain commercial channels on a platform operated by Media Broadcast, and will be subject to a monthly fee, expected to be around €5 a month. The pay TV element will use a cardless system using a conditional access module, mirroring the system used by Austria's terrestrial TV service Simpli TV. Germans will need to look out for devices sporting the green DVB-T2 logo (shown above); unlike the UK Freeview HD service that is also based on DVB-T2, the German service will use the newer, more efficient HEVC video standard instead of MPEG4/AVC, which is used in the UK. The first compatible devices are now available, but there will be a wider and cheaper choice of devices available by the time the service begins its roll-out in summer 2016. All original digital terrestrial TV receivers will become obsolete - however because fewer people in Germany use terrestrial TV, the switch will have a much lower impact on the public than in countries where terrestrial TV usage is higher. Commercial broadcasters have previously shown only limited commitment to digital terrestrial TV in Germany. After the initial roll-out of digital terrestrial TV, the commercial channels refused to extend their reach, leaving many areas with just a limited service. Two years ago, Germany's biggest commercial broadcaster RTL announced it was leaving digital terrestrial TV altogether, but has since done a U-turn with the impending introduction of a terrestrial pay TV platform. In Germany, all major commercial broadcasters have used the switch from standard to high definition as an excuse to encrypt their services. They are legally obligated to keep existing standard definition services on cable and satellite free-to-air until 2023. Test transmissions are already underway in some cities. From summer 2016, a pilot service, available across most urban areas will launch with a small selection of channels, initially all free-to-air. 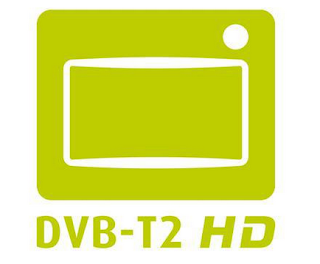 Then, region by region, the original digital terrestrial TV service, which replaced analogue TV only a decade ago, will be switched off, allowing the full six multiplex DVB-T2 service to launch. As part of the changes, terrestrial TV services will be moved out of the recently auctioned 700 MHz frequency band, so that mobile network operators can take over the frequencies for mobile internet services in 2019. The map below, published as part of the publicity campaign, shows where the full six multiplex service will be available. 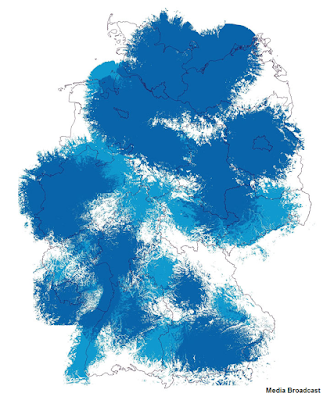 The darker blue areas show where broadcasts will become available within the next 18 months as part of the pilot phase (beginning with limited channels, followed by a roll-out of the full service as existing services switch to DVB-T2), the lighter shade of blue shows where the new service will be available by 2019. The map is from Media Broadcast, Germany's version of Arqiva. Media Broadcast will be responsible for the commercial multiplexes and the operation of the pay TV platform. More areas than before, including more of the former East Germany, will be able to receive the full range of public and private terrestrial TV services. Similar to the UK, there will be areas where only a basic service consisting of just the public broadcasters will be available - the unshaded areas above. As part of the publicity surrounding the new service, a new website - www.dvb-t2-news.de has been set-up to explain the changes and to keep the public and trade informed of new developments. I think we're at around 70% now for HD and of course this government wants to steal bandwidth from Freeview so people can watch content on much smaller screens, but if nothing else it's a wonder the BBC aren't beginning to push for a HD switchover which would enable them to give up one of their muxes and half their broadcasting costs on Freeview.